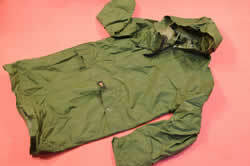 Nylon jacket. Long front zip and velcro fastener. Drawstring hood with plastic toggles. Deep pockets on either side at front. From neck 97(l) x 63(w)cms. Sleeve 56 (l) cms. On black label on pocket reads "CAGJAC" laundry label inside reads "MADE BY CRA( )�PPERS M 100% NYLON" then laundry instructions then "BATLEY ENGLAND".